StoryBots is a knowledge centered online tool to help pre-K to 1st-grade students learn several topics, such as the alphabet, numbers, emotions, and colors. ISTE Standards for Students Empowered Learner, Digital citizen, Creative communicator, Global Collaborator. StoryBots have different features available to enhance the students learning experiences. Teachers can use the video “learning” feature to target new content, as the alphabet, numbers, emotions, and colors. StoryBots contains online books with recorded narration so students can read along simultaneously as they listen to the story. You can create different characters that can later star in a book or video. The tool also contains activity sheets to support the content of the videos. As a teacher, you can sign up to have free access to all of the materials and content on the site. If you are not a teacher, you can register for free and have some materials available for your use or you can pay to access the entire site. Teachers can assign activities to students. Students can get access to these activities at their homes with the accounts created by their parents independently if it is a free or paid account. If you are looking for ways to enhance your young students’ knowledge with videos, online games, online/offline activities, and books, Storybots is a good tool to explore! Please click on Transcript: to read it! Designer Information: StoryBots was created by JibJab studios Bro.It was funded by Evan and Gregg Spiridellis – siblings who founded JibJab in 1999. They mostly work in the entertainment area. If you don’t want personal information to be viewed by others, you shouldn’t submit for public posting on the jibjab sites. JibJab does not collect personally-identifiable information such as: IP addresses , browser type, aggregate user data. This tool appears to have been created just for English speakers, however, a positive aspect of this tool is that it features non-human characters to interact with, and students have the opportunity to become a character “inside” the application. Substitution: Students can learn how to associate the first letter of a word with examples (Apple start with “A”) with a video on Storybots (rather than watching the teacher talk about it in class). Augmentation: Students learn how to read with books that allow them to listen as they explore the text. Redefinition: Students can become the main character in the videos and books on the site. StoryBots allows students to learn in a meaningful way while exploring the content of books and videos and then replicating this knowledge through activities. While students are playing games and doing online activities, either individually or as a group, they construct their knowledge through activities and interacting with the content of the website. Language (English): Students can learn the alphabet from music videos on Storybots and practice their knowledge with activity sheets provided through the website (painting, writing). Mathematics: Students can learn numbers from videos, games,books, and activity sheets provided by Storybots. Addition and subtraction: Students will learn through activities and online games how to add and subtract with different levels of difficulties. Geometry: Students can be introduced to different shapes with music videos and books and then test out their new knowledge with games, activities, and homework provided through the website. Science: Students can learn about the solar system through music videos. A little window is going to pop up where you need to fill in your information: Your full name, email address, create a password, grade you are teaching, the name of the school, the website of the school, address of the school, country, city, state. When you finish, you are going to see a welcome page where you can add a picture as a profile (it can be taken with your camera or uploaded from your computer) Note: you can skip this step. Now, you can name your class and add the names of your students, when you finish, click on the big green button “Create your Class”. Note: if you don’t have a list of students you can add/erase them later. Now you have the option to print invitations to invite parents to be part of this classroom so they can use the tool at home with their children. Note: You can send the invitations later too! Class roster: edit and review your classrooms: you can see the whole class and decide to add, delete or change the student’s names . Invite Parents: send an invitation to families: you would have the list of students and you can choose to send and email invitation or print the invitation. Both of them come with a class code. Group Builder: create a group of students: you can create as many groups as you want. Students can be in one or more groups at the same time. Your Lessons: design your lesson plan with the material of storybots and assigned to your students. As groups, individually or as a whole class. 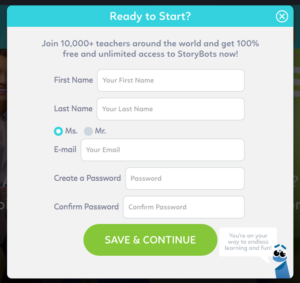 StoryBots Lessons: Use the lesson Plans of storybots and assign them to your students. As groups, individually or as a whole class. Math games : common core content games, assign them to student groups, individually or as a whole class. Starring your books: you can select students to participate as par of the book. Note: you need parental permission first! Starring your videos: you can select students to participate as par of the video. Note: you need parental permission first! Activity sheets: you have full access to print and distribute this to your students. Heath-Reynolds, J., & VanWeelden, K. (2015). Integrating Apps With the Core Arts Standards in the 21st-Century Elementary Music Classroom. General Music Today, 1048371315589127. Van Peer, W., Zyngier, S., & Viana, V. (2010). Literary Education and Digital Learning: Methods and Technologies for Humanities Studies. Information Science Reference. Kory, J. J. M. (2014). Storytelling with robots: Effects of robot language level on children’s language learning (Doctoral dissertation, Massachusetts Institute of Technology).